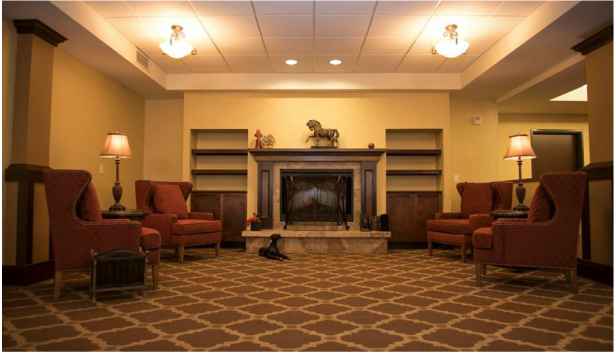 Joshua Springs Senior Living is a 92,000 square foot, 3-story, senior housing community consisting of 74 assisted living units as well as 17 memory care units and was completed in the summer of 2015. The open floor plan design of the project exhibits our unique approach to the common areas of both assisted living and memory care environments, which allows visibility to all living areas and a natural flow to the space. From the front entry, residents and visitors are invited into the space with uninterrupted views of the activity beyond, creating an energy in the space that is contagious. Joshua Springs Senior Living is designed to cater to active seniors, those needing assistance with activities of daily living, and those with dementia or other memory loss. The space provides residents with a beautiful home-like environment complete with large dining areas and a bistro that overlooks shaded, landscaped patios. Additional activity areas, a wellness room, library, lounge, beauty salon and performance area encourage social interaction through a wide variety of experience settings. The memory care wing is complete with a vaulted dining area that spills out onto a shaded patio and garden in addition to a large living and activity space.